After much hard work, The Bridge hosted a soft opening for their newly appointed office at Humber College North campus on Jan. 31. 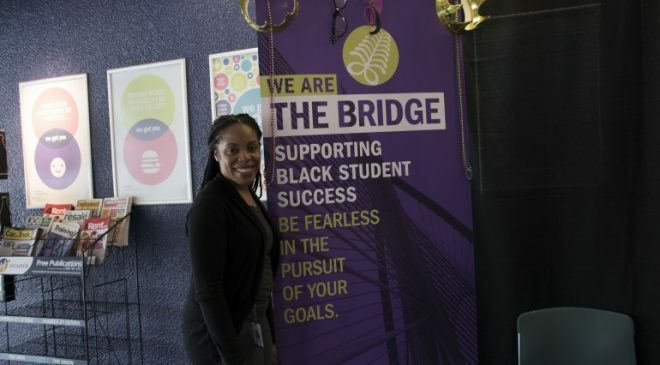 Initially formed at Humber Lakeshore campus, The Bridge is a support system for students who identify themselves as African, Black or Caribbean. After seven years at Lakeshore campus, the program migrated to North campus last year. “Basically, it’s a support,” said Martina Douglas, a representative from the program. The Bridge works to create a safe space for all students focusing through an Afro-centric lens. There are many workshops conducted for students, especially for international students who may require support throughout school-life. “We know that anti-black racism still exists in Canada and it’s important to have an outlet,” Douglas said. The soft opening event featured activities and food with a free cotton candy stand. The music, balloons and treats definitely attracted a large crowd of at least 50 students to the new office. Douglas referred to The Bridge as a second family for its students. International students who have left home to study in Canada can rely on workshops and support to help ease their transition, she said. The Bridge is now open and ready to support, inspire, and create safe spaces in the Humber environment. Students can access The Bridge at E103 at North campus and A168 at Lakeshore campus.